Sholom Scouts celebrated their first milestone when they conducted their first investiture ceremony earlier this month at Temple Sholom. 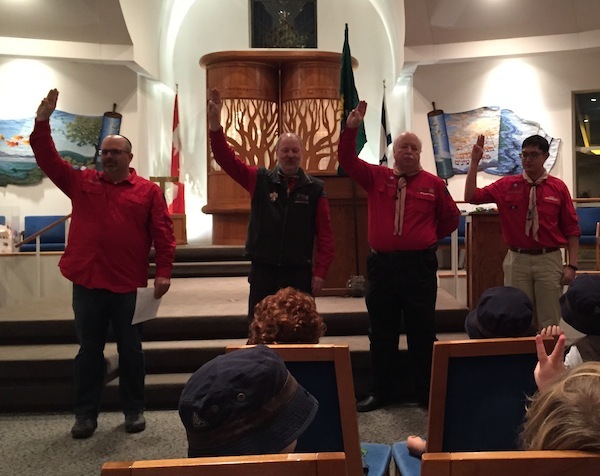 The ceremony is a central part of Scouts Canada, when new members become invested as scouts. New scouts make the Scout Promise to the Scouts leader and, in response, the Scouts troop leader pledges to help the scout do their best to uphold the promise, setting up a bond between them. It’s the first time since the 1940s that a Jewish Scouts troop has existed in Western Canada. The rise of Sholom Scouts can be attributed to the vision of Temple Sholom Rabbi Dan Moskovitz. So, approximately a year ago, he went to the Scouts Canada house on Broadway and spoke with one of their representatives about how to start a troop. 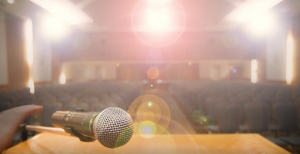 “I explained my desire and also that I was a rabbi and had access to a building to meet in and a network of other Jewish parents that might want the same experience for their children. He said they had been trying to start a Jewish Scouts group in Vancouver for more than 15 years but didn’t know where to begin, so it was bashert. They started helping right away with open house meetings for parents and kids and we got the word out through social media,” he said. The boy troop now consists of eight beavers (5- to 7-year-olds) and eight cubs (8- to 10-year-olds) with members from across the Jewish religious spectrum. The children meet biweekly, even though, according to Moskovitz, they will be shifting to a traditional weekly program next year. The children have a bimonthly outdoor event, hiking, camping or another such activity. In May, Sholom Scouts will participate in an area-wide family campout with other Scouts groups from the Lower Mainland. All Sholom Scouts activities are in line with kashrut observance, with a kosher kitchen on site, and are shomer Shabbat, including services as part of the campground experience. Before the March 5 investiture ceremony, Moskovitz gave a tour of the synagogue to help another troop, Ryerson, obtain their religion and spirituality badge. There was a falafel dinner, at which the rabbi received an appreciation award from Scouts Canada, followed by Cub Car and Beaver Cubby Racing. The investiture concluded the evening. The ceremony was important for other reasons, as well. Raphy Tischler, Sholom Scouts Beaver leader, linked it to Jewish holidays such as Sukkot and the Zionist value of “Ahavat Haaretz.” “Living on the West Coast, it is only a natural connection to combine scouting and Judaism. I want the Jewish community to recognize the potential of outdoor programming as part of a well-rounded Jewish experience,” he said. Sholom Scouts are currently in need of more volunteers. Becoming a volunteer is a multi-step process that includes a personal interview, provision of three personal references and a police record check. Afterward, there is an online training session and mentoring with a local scout leader, where you learn about programming for youth. Moskovitz believes it is a great way to bring Jewish parents together with their children. “Ninety percent of your Jewish life is lived outside of the synagogue. Scouts helps raise you in the world as a Jew and in the surroundings. It uses the quote, ‘Don’t separate yourself from the community’ … be a part [of it] but be a Jew,” he said. Gil Lavie is a freelance correspondent, with articles published in the Jerusalem Post, Shalom Toronto and Tazpit News Agency. He has a master’s of global affairs from the Munk School of Global Affairs at the University of Toronto.